and varies in type, while 'user_arg' is a user-supplied argument. The meaning of the return type also varies. See the individual use cases, e.g. the FETCH statement, for details on them. Parses a column assignment in an update. Parses a column definition at a table creation. column sym table node in: if not NULL, column is of type NOT NULL. is_unsigned in: if not NULL, column is of type UNSIGNED. Completes a query graph by adding query thread and fork nodes above it and prepares the graph for running. The fork created is of type QUE_FORK_MYSQL_INTERFACE. Parses an index creation operation. Parses a table creation operation. Parses a fetch statement. into_list or user_func (but not both) must be non-NULL. Retrieves characters to the lexical analyzer. If the literal value already exists then it rebinds otherwise it creates a new entry. Get bound id with the given name. Get bound literal with the given name. Release any resources used by the lexer. Parses an open or close cursor statement. Parses an ORDER BY clause. Order by a single column only is supported. 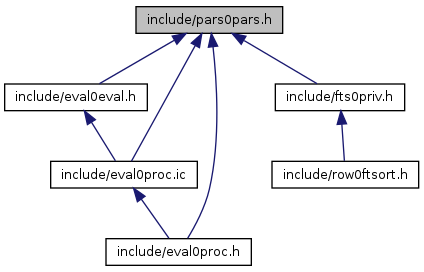 Parses a procedure parameter declaration. Parses a select list; creates a query graph node for the whole SELECT statement. Parses an SQL string returning the query graph. Parses a stored procedure call, when this is not within another stored procedure, that is, the client issues a procedure call directly. In MySQL/InnoDB, stored InnoDB procedures are invoked via the parsed procedure tree, not via InnoDB SQL, so this function is not used. Parses an update or delete statement. Parses a delete or update statement start.